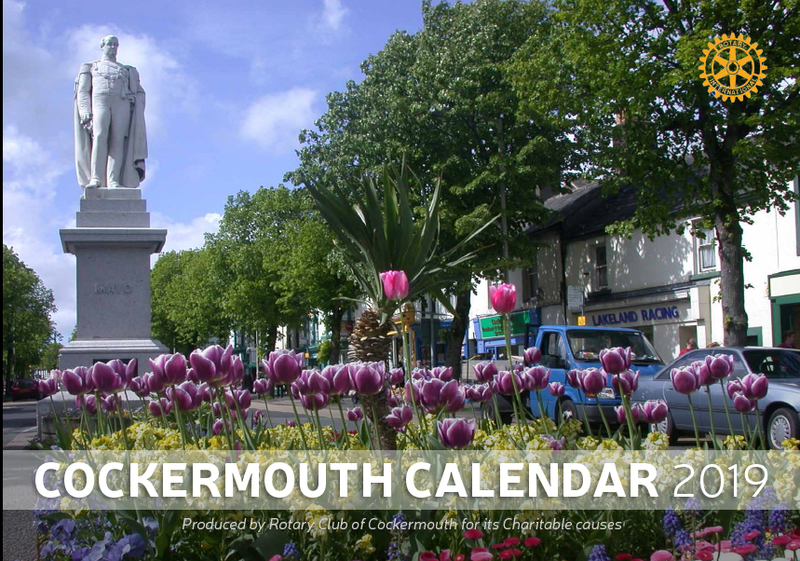 The Cockermouth Calendar 2019, created by the Rotary Club of Cockermouth. "A delightful idea for Christmas...a reminder of our great Georgian town!." Cockermouth Rotary Club have produced a unique calendar for 2019. It features 12 pictures reflecting the town throughout the year. It is in full colour printed on glossy paper. Money raised by the calendar sales will be devoted to use by charities aided by the Rotary Club of Cockermouth. To order online (Total £9.0) click the Paypal button. NB Please ensure you have included your postal address and post code either on the Paypal page or via an email message to dave@lakestay.co.uk. It can also be bought directly at Percyhouse Gallery, Anabelles, the New Bookshop, Strolling for Shoes, Fyne Fish and Shills. Payments wil be made via myself: David Siddall, Community committee chairman on behalf of the Club.